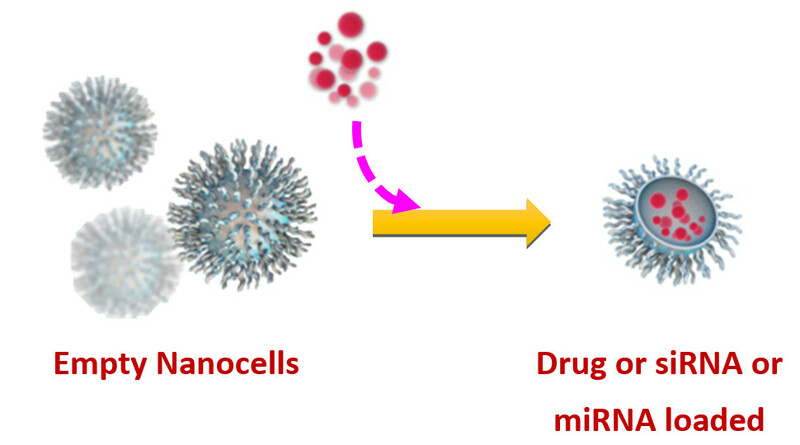 EnGeneIC’s bacterially-derived EDV™ nanocell platform (EnGeneIC Dream Vector) is a first-in-class, cyto-immunotherapy technology for the treatment of cancer. EDV™ not only delivers toxic payloads to tumors, it stimulates the adaptive immune system to augment the anti-tumor response. 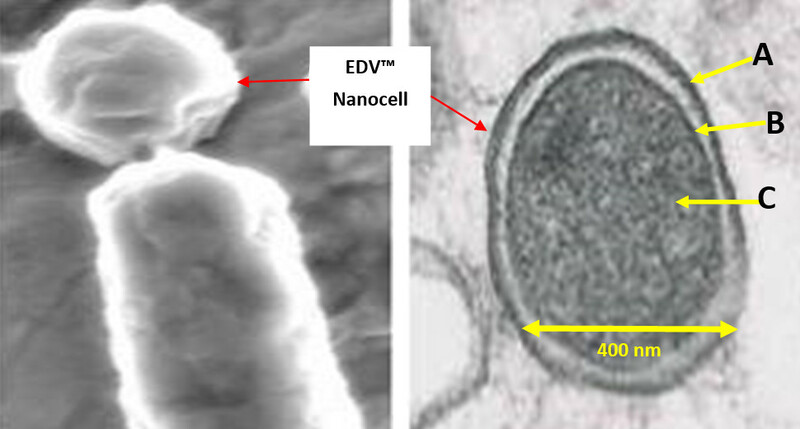 An EDV™ is a nanocell formed when a genetically modified bacterium divides at its pole as well as centrally. The smaller portion which doesn’t contain a chromosome, forms the EDV™. A single 400nm EDV™ can be packed with up to 1 million molecules of an anticancer drug such as Doxorubicin. In addition, regulatory genetic molecules (siRNA/miRNA) can also be loaded in therapeutically significant concentrations as demonstrated in animal and human trials. Payload-packaged EDV™ is coated with a bispecific antibody which attaches through antibody-antigen interaction to the EDV™ at one end, and has specificity to cancer cells on the other end. The tumor targeting antibody can be changed depending on the type of cancer. 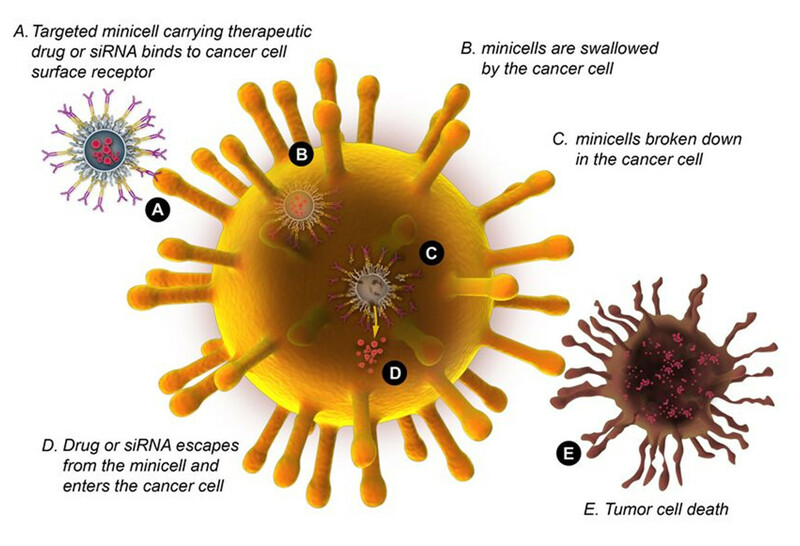 The tumor cell-surface receptor being targeted does not need to be unique to tumor cells as explained below. 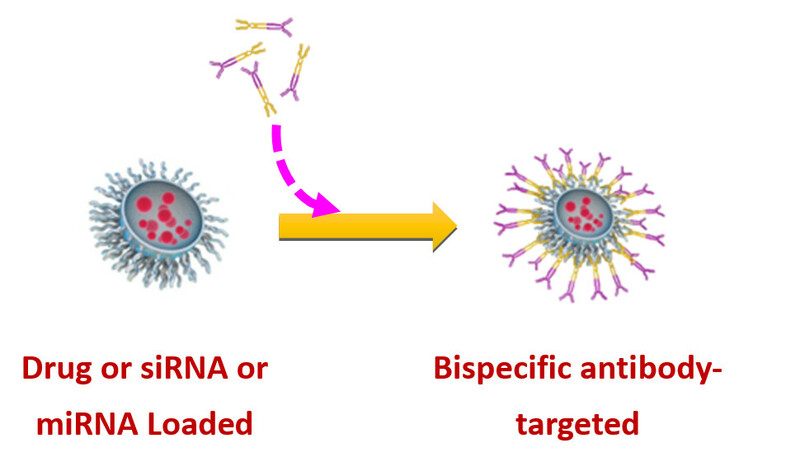 Bispecific antibody-targeted, payload-packaged EDV™ nanocells only exit the leaky blood vessels associated with tumors (passive targeting) and enter into the tumor microenvironment. This is because of their size being 400nm ± 20nm which is too large to escape through the normal vasculature associated with normal tissues. This allows us to target the EDVs™ to receptors like EGFR which are over-expressed in many solid tumors but are also expressed on normal cells. However, the EDVs™ do not come in contact with normal cells and this has been demonstrated in biodistribution studies in animals and human trials also show absence of toxicity to normal tissues despite targeting the EDVs™ to EGFR. Once within the tumor microenvironment, the bispecific antibody binds to the tumor cell-surface receptor. 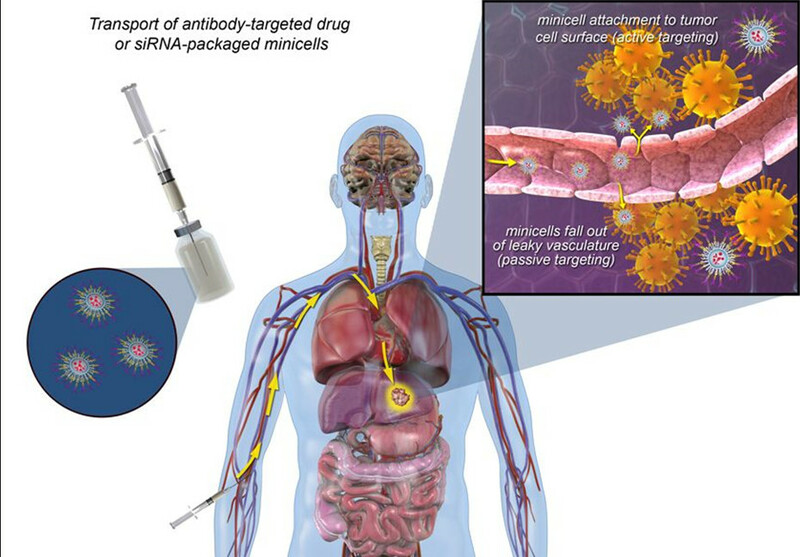 Once bound to the tumor cell, the EDV™ is taken up, broken down within the cancer cell and releases the payload of chemotherapeutic drug or siRNA or miRNA. In doing so, EDV™ nanocells enable current cancer treatments to be more potent and far less toxic. The residual EDVs that did not make it into the tumor microenvironment, are engulfed by cells of the immune system e.g. macrophages and dendritic cells and since the EDVs are derived from bacteria, they carry potent immuno-stimulating components which appear to bypass the immuno-suppression caused by the tumor. This reactivation of the immune system can result in potent anti-tumor efficacy as has been observed in several dogs with Stage IV brain tumors and one end-stage patient in the on-going mesothelioma clinical trial.